Business After Hours are informal networking events held at member companies. Attendance ranges from 75 to 200 people. At Business After Hours, businesses are invited to introduce themselves to other businesses, enjoy refreshments, beverages, tours, prizes, and more. Don’t forget your business cards! If you are interested in hosting a Business After Hours networking event at your business, please contact Lexi Reinertson at (508) 586-0500 x 231. The next Business After Hours is listed below! Join us for an evening of networking. In anticipation of Small Business Month in May, the Chamber is kicking off Small Business Month early with this networking event at Eastern Bank. Enjoy refreshments by Georgio’s in Brockton also well as beer and wine while meeting new contacts in the Metro South community. Don’t forget your business cards! Eastern Bank has helped generations of individuals, families, and businesses reach their goals for nearly two centuries. They’ve accomplished it with honest values and service that always puts their customers first. It’s how they’ve grown to be the largest independent mutually owned bank and earned their reputation as a bank that cares about its customers, communities, and employees. Register online at www.metrosouthchamber.com/calendar-registration or by e-mailing your RSVP with your full name and company name to Lexi. Crescent Credit Union Business After Hours event. August 17, 2017 at The Bradley Estate in Canton. 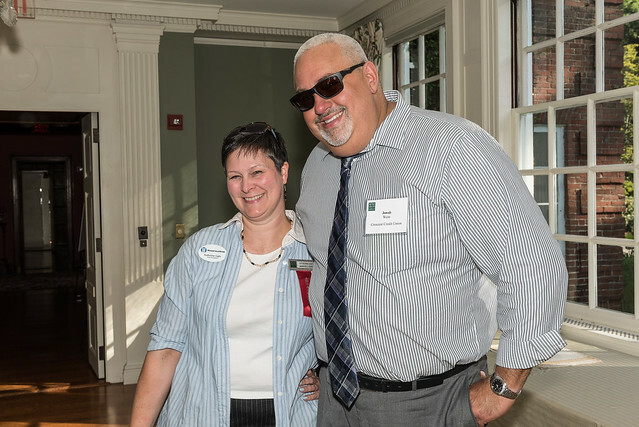 View a collection of photos from Business After Hours in the past.